When you book a stay at JW Marriott Houston, you'll escape from the stresses and distractions of everyday life. As one of the top luxury hotels in Houston, we pride ourselves on delivering an authentic experience expertly curated for you. Choose from a wide range of opulent accommodations, including our concierge-level guest rooms, which include access to our exclusive lounge that provides complimentary hot breakfast, hors d'oeuvres and beverages. Sip and savor at one of two upscale restaurants, most notably Destino, which offers freshly prepared, farm-to-table cuisine. Burn off those calories by using our state-of-the-art fitness center, then relax and swim in our private rooftop pool overlooking the city skyline. From our hotel, walk across the street to Texas's largest shopping center, the Houston Galleria, or catch a game a few miles away at Toyota Center or Minute Maid Park. 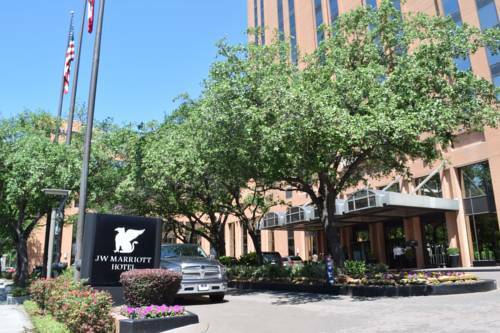 Whatever brings you to town, JW Marriott Houston is the ideal choice for travelers seeking luxury and long-lasting memories. At our premier Houston Galleria restaurant, Executive Chef David Fransua has partnered with local food artisans, organic farmers and sustainable fisheries to deliver authentic regional Texas cuisine with a fresh twist. Open for lunch and dinner. Perk up your day with all your favorite coffees, chai teas, cappuccinos, pastries and more!